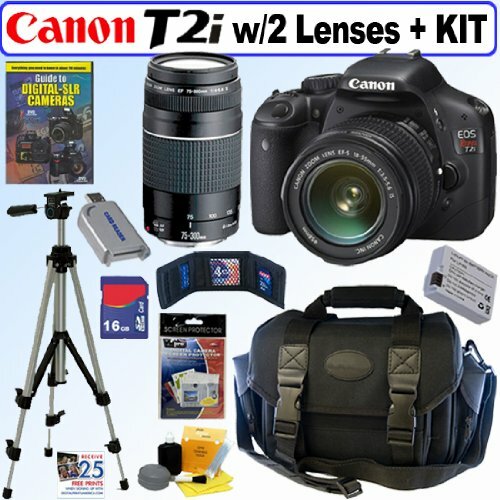 The new flagship of the EOS Rebel line, Canon EOS Rebel T2i brings professional EOS features into an easy to use, lightweight digital SLR that’s a joy to use. Featuring a class-leading 18.0 Megapixel CMOS Image Sensor and increased light sensitivity for low light photography, the EOS Rebel T2i also has an advanced HD Movie mode for gorgeous Full HD movies. Able to capture up to 3.7 frames per second, it’s ready to go the minute it’s picked up. Advanced Live View, a new wide-area screen, plus features like Canon’s brilliant Auto Lighting Optimizer and Highlight Tone features ensure brilliant photos and movies, easily. With some of the most advanced features of any digital SLR, it’s simply the best Rebel Canon has ever created. Canon EF-S 18-55mm f/3.5-5.6 IS SLR Lens: Canon’s latest optical Image Stabilizer (IS) technology provides up to 4-stop compensation for image blur caused by camera shake and slow shutter speeds. Photographers normally shooting handheld at 1/250 sec can switch on IS to obtain a similarly steady and blur-free result with a shutter speed of just 1/15 second. The inclusion of automatic panning detection makes it easier for photographers to track wildlife and other moving subjects. Canon EF 75-300mm f/4-5.6 III Telephoto Zoom Lens: An economical DC motor driven AF zoom, with the same optical system, construction, and exterior as its USM sister model. ++PLUS++16GB Deluxe Accessory Kit: 16 Gigabyte SDHC Secure Digital Memory Card – Secure Digital USB Card Reader – Memory Card Wallet – Pack of LCD Screen Protectors – Well Protective SLR Camera Gadget Bag with Pockets & Strap – 5pc Deluxe Lens Care & Cleaning Kit – Full Size 59″ Tripod W/Case – Jumpstart DVD Guide to Digital SLR Cameras – BONUS!! Greeting Cards for Dummies – Free 25 Quality Prints (Promo code # on invoice).